McWilliam Windsocks have provided Commercial, Industrial and Private use Windsocks and Windsock Masts Worldwide for over 25 years and have a wealth of experience. 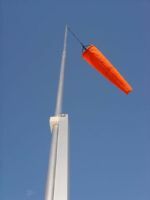 We are a family-run business and are always available to help you in making the correct choice of Windsock. The most popular McWilliam Windsock uses an integral heavy duty hoop which is sewn into the mouth of the Windsock. High quality webbing straps (no rust) and a stainless swivel snap-on hook attach to an existing Mast or one supplied by McWilliam. We also supply Lace-on Windsocks which are supplied with eyelets and Cable-ties to attach to an existing swivel installation. 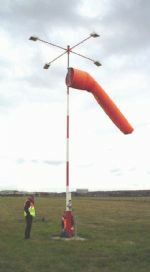 McWilliam Windsock sizes range from small 3ft up to 4.3m International Airport size Windsocks. Lettering, Logos, different colours and sizes of Windsock are no problem to produce. We often find that many customers have requests out of the ordinary and we deal with all queries. Please feel free to have a look at our products and contact us for a quote or just to discuss the products you see, if there is something that you need that isn't on the site, we can usually make it or source it for you.